Considering that the GeForce GTX 1080 and GTX 1070 date back to May and June of 2016, you might be expecting next-generation Nvidia cards to drop at any moment. Think again, as with AMD's Radeon RX Vega struggling to compete at the top-end of the market, Nvidia is quite content to keep Volta on the back burner while reshuffling its 10-series portfolio to stave off any Radeon challenger. We've seen such a rearrangement this past week, with Nvidia intersecting its 2016 GPUs with the new GeForce GTX 1070 Ti. 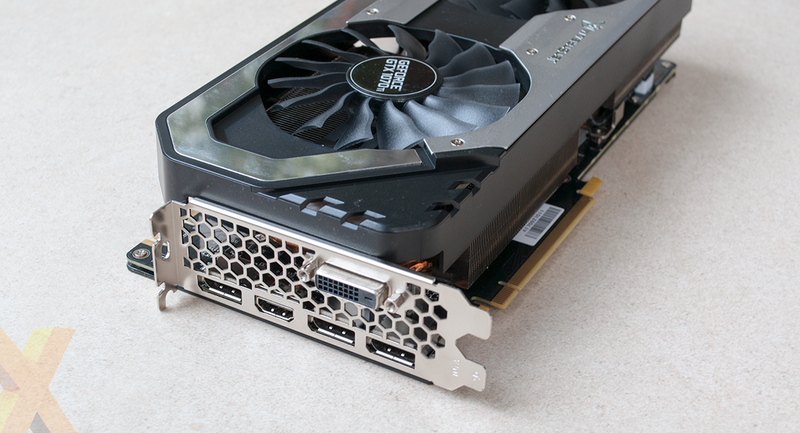 New in name but familiar in make-up, the GTX 1070 Ti is essentially the same GPU as GTX 1080 and GTX 1070, with all three carrying a unique number of active SM units in order to create the artificial segmentation needed to hit specific price points. 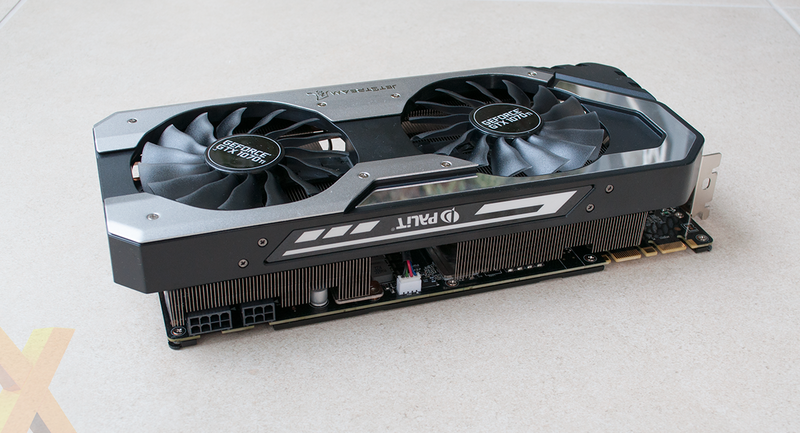 Carrying 19 SM units, the GTX 1070 Ti is much closer to the GTX 1080 in specification, and arrives on the market priced between £420 and £500, an arena in which it battles directly with the Radeon RX Vega 56. 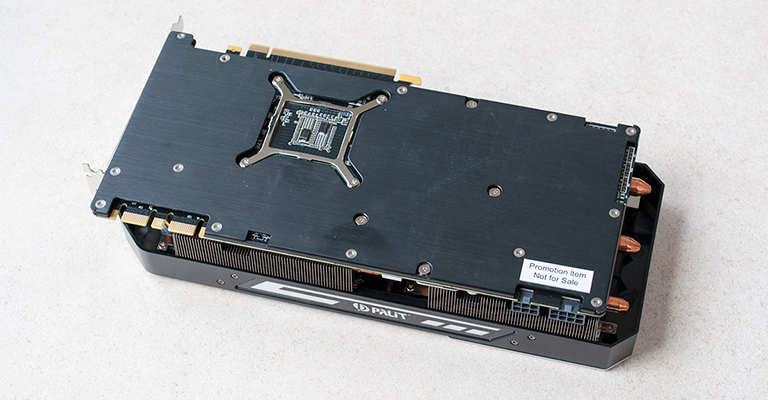 What makes the launch interesting, or frustrating depending on your point of view, is that Nvidia's position of strength has seemingly permitted full jurisdiction over its partners, who have been instructed to keep all 1070 Ti cards clocked at reference speeds. We can understand Nvidia's thinking - it obviously doesn't want overclocked cards snapping at the heels of GTX 1080 - but limited speeds do pose a headache for manufacturers hoping to ship multiple SKUs. Take, for example, Palit, who is joining the GTX 1070 Ti party with three models; Dual; JetStream; and Super JetStream. Pricing is set at £420, £470 and likely close to £500, respectively, for three variants, yet each is shipped with exactly the same frequencies. Why pay extra for the flagship Super JetStream, then? Well, there are neither bundled games nor software utilities to help incentivise gamers, so you really need to be a fan of the Super JetStream design. 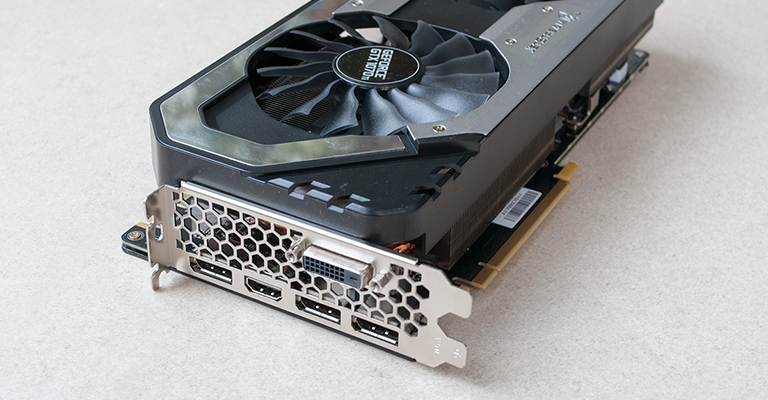 Maintaining familiarity with previous cards, the GTX 1070 Ti variant is a chunky beast, occupying the best part of three slots and measuring almost 290mm in length. The mirrored trim on the plastic shroud can scuff quite easily, as does the full-size back panel, but the black-and-silver colour scheme is inoffensive and well-suited to just about any build. LED illumination isn't as prominent as it is on rival cards, though Palit does add a backlight to the company logo and pattern adorning the top edge. This illuminates green at boot and changes colour based on core temperature. A design as meaty as this needs to come equipped with enthusiast-orientated features, and Palit obliges with a dual-BIOS switch that's useful when tinkering, voltage measurement points at the end of the PCB, and a cooler that should have no problem handling an end-user overclock. It's a formidable-looking beast, though it's a shame the four-pin fan connector is positioned where it is - the white head is particularly conspicuous in a windowed chassis. Five thick copper heatpipes spread from the contact plate and traverse densely-packed aluminium fins encompassing the majority of the card. Dual fans provide the airflow (both switch off when GPU temperature is low), and as a nod toward the overclocking crowd, Palit sources power from both eight- and six-pin connectors. Helpful if you're going to be pushing the GPU to the limit? Perhaps, though we reckon Nvidia's reference eight-pin specification is plentiful for the majority of users, and the extra six-pin on offer here may serve only to add to cable clutter. Elsewhere, a pair of SLI fingers are available for anyone willing to contest the potential pitfalls of a multi-GPU configuration, and the display outputs lining the perforated I/O panel include the usual selection of dual-link DVI, HDMI 2.0b and a trio of DisplayPort 1.4. 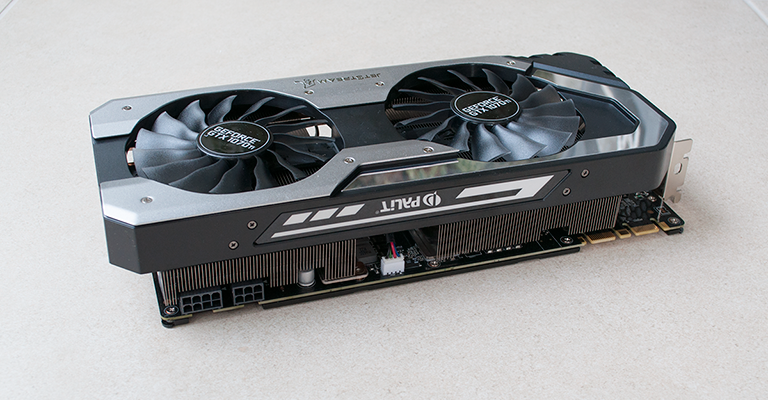 This has the makings of a solid GTX 1070 Ti, but Palit's strength traditionally lies with aggressive pricing, and that's where the Super JetStream may come undone. 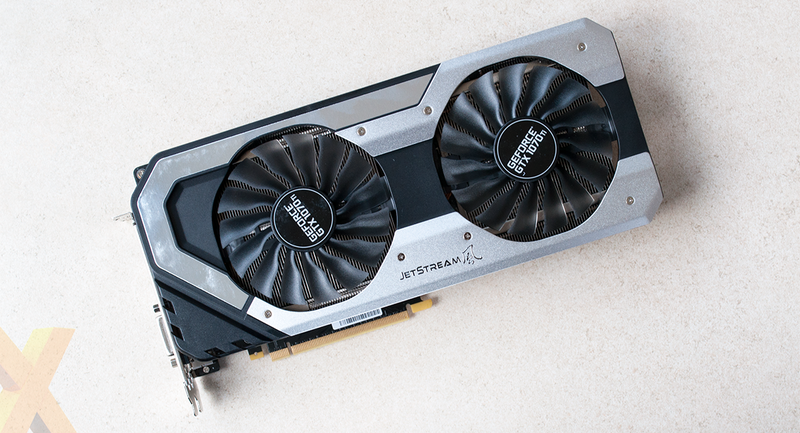 Although the card has yet to appear at the popular retailers, Palit's GTX 1070 Ti Dual is available for £420 while the regular JetStream fetches £470. The Super JetStream, albeit clocked the same, is likely to attract an additional premium, putting it uncomfortably close to RX Vega 64 and GTX 1080. We'll have to wait a while to see how pricing will settle, but in the meantime, who's up for some more stock-clocked GTX 1070 Ti benchmarks?